There are those who still think definitives are boring. I suppose they have rows of identical stamps in mind, in a small format, with only the colour changing for each value. And even then I don't agree with them! But be that as it may, you can't really argue with the fact that Canada issues the most beautiful high value definitives you've ever seen. I was therefore very happy when Carmen mentioned them in the ongoing forum thread on which country issues the most beautiful stamps. The $10 Blue Whale is indeed a stunner to look at and one in a row of magnificent stamps. The high value definitive series depicting mammals started in 1997, and by now an impressive range of stamps has been issued. One of my favourites of the lot is the one depicting a loon. I've had it for years but took it out again to have another loving look and scan it for this blog post. It was then that I discovered that there is some microprint included which gives you the Latin name for the mammal. Look under the DA of Canada. Or at the dark blue wavy lines on the whale stamp. Once you've spotted them, you wonder how you could ever not have noticed them! What I also like very much about these issues is that you get all the necessary info on the sheet margins. They include the name of the printers, of the designer and of the engraver. Perfect! I'm only wondering why there is an "Illustration" mentioned as well. Is the design based upon an existing illustration, maybe? The moose margins give even more information. There's a C1 which I suppose is a plate number? There's hooves for all the different printing colours. And there's the mention of petroglyphs and a national park. I had to Google that but it appears that the drawing in the bottom left corner is such a petroglyph. And what's more: if you take out your UV-lamp, you'll find a similar image, but mirrored, hidden in the design somewhere. So you see, just a handful of definitive stamps yield a world of information and beauty. Well done, Canada! 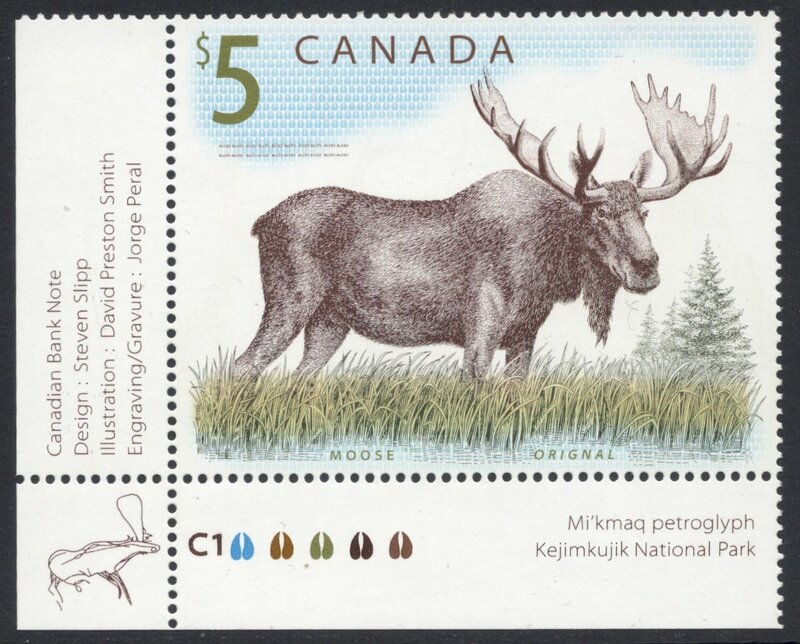 On the moose stamp, what's the blue stuff underneath the $5? Hooves? I've had a look at the image enlarged, but I still can't tell. Very perceptive! Yes, the whole blue cloud is made up of little hooves, identical to those ink colour hooves in the sheet margin. And what's more: the water at the bottom of the design is also made up of the same hooves. Clever! I like 'em more and more! I just went back to it to look at the water - quite amazing really! Just as I converted you to Newfoundland last week, you're converting me to modern Canada. Well, maybe we can start a campaign to get all-world collecting back into fashion. About time an' all! 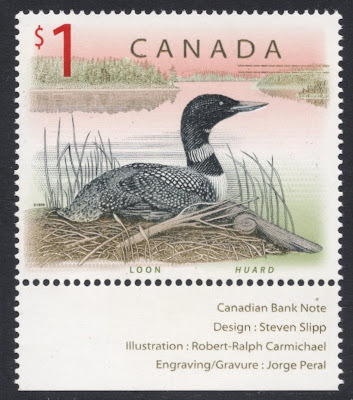 By the way, I haven't seen the complete sheet margins of the loon stamp but there too it seems that some parts of the design consist of similarly shaped shapes (check right of the reed bed on the right). Fascinating stuff this! I've been looking for a corner marginal of the loon stamp, and haven't got one yet, but I did find this cool wood-carving of the stamp! Re 'Illustration v Design' I suspect the designer adds the captions to the illustration. Either that or the designer comes up with the basic concept and the illustrator produces the picture. And to further comment on the beautiful $10 Blue Whale, make sure you check its tail area out with a UV lamp... therein you will find a proportionately-sized diver, showing you just how massive these beautiful mammals are and how they well deserve the title of "Largest known animal to have ever existed". On January 23, Canada issued a set of #10 pre-stamped envelopes featuring the designs of the high-value stamps. There are 10 envelopes in a package that sells for CDN$7.10 - one of each of the nine designs plus a random duplicate. I don't know how these are printed, probably not engraved, but they can make a nice addition to the stamps. I tried to find them on the Canada Post website. I think it took me nearly a quarter of an hour, but I found them! They do look nice. If I understand correctly they've been changed to standard inland rate? A very nice addition indeed! On the moose stamp,at the bottom the 5 color symbol and the letter c1 ,what does it signifies???? The C stands for the printer of the stamps (Canadian Bank Note Company), the 1 stands for the number of the cylinder used to print the stamps (sometimes, if there are many reprints, a new cylinder is made which would then be numbered C2, etc. ), and the 5 colour symbols are the five colours used to print this stamp. The number 1 represents Plate # 1 of the engraved colour of the stamp. Let me compliment you Adrian in providing a very interesting blog for collectors. Thanks, lithograving, for your very kind words and your information! Being merely a general Canada collector I take your word for it all, but does not that mean that the paper manufacturer gets quite a prominent name check here? Especially since the C and the 1 seem to belong together. Seems a bit odd to me, to be honest! Maybe you can shine your light on that as well? Hope so!